There is a word that we hear or use on a daily basis, but don’t seem to understand enough. We all expect from others to recognize creativity as one of our qualities. Yet, during our child’s growing up, it is often left on the side, while striving to encourage intellect, learning abilities, analytical thinking etc. We invest all our resources in their education, while suppressing imagination and playfulness. Since we started studying the term “creativity”, we had used a lot of words to define it, but more important is to form a clear picture of its origin, together with our children. Is it a virtue of all human beings, or just a few lucky ones? The experts outline two directions – creativity as a given thing, or as a potential. On a theoretical level, differences between those two stands are huge. But also, they lead to different consequences in practise. Those who see creativity as a given thing, born gift or a talent which one simply possesses or not, don’t do much on developing it. That’s exactly why you and your young ones should be followers of that second belief and discover all the ideas and thoughts within yourselves. 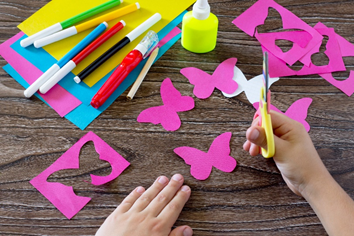 So, what can you do to make your child grow into a creative person? Above all, make a personal example! 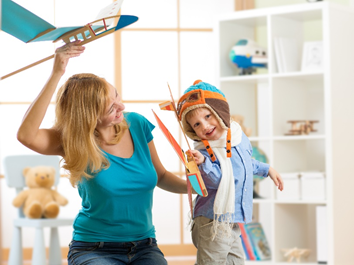 We know that a child’s first role model is the parent. Knowing that, be imaginative, create new stories and new worlds, think of a hundred answers to a single question, see in simple objects what others couldn’t! Turn an old pallet with some nice colouring into a brand-new book shelf. Then fill it up with interesting books. Why not to make an ordinary jar into a decorative vase, a decorated tin into a pencil box, a framed napkin into a piece of art, an old sweater into an interesting pillow, etc. 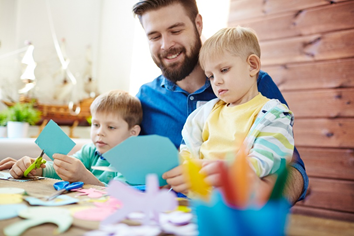 Using colour, shape, music and words express what you hold inside and encourage your child to do the same, over and over again! Play and create together with your kids and enjoy it. Creativity is a very complex process which engages intellectual capacities, often requires good observation and a deductive reasoning, while sometimes it includes motor skills as well. But what stands as a prerequisite to every creative process is a divergent thinking. Once the child starts looking, not for the exact one, but for as many different solutions as possible, then we could say that we had taught our child to think divergently. When they look at the same thing from many different perspectives and form a critical view on various facts and possibilities. Seems as a valuable skill in today’s world! But it does not come easily, it needs to be taught from the earliest age. Not the school age, but much before! Therefore, pay big attention to a child’s play. Let them fantasise, let them be whatever they like – a doctor, a diver, a tv host, a parent or an astronaut. Let them try out many different life rolls standing on their path. And You, You be right there beside them, taking a role of a patient, a sea turtle, a famous actor, etc. Take one weekend and devote it to nature exploring, playing in the sand, and the next one to artistic creation. Read the existing stories and come up with new ones. Solve riddles and have many answers to child’s curious questions. Give your little ones freedom and help them discover and express their uniqueness!